Larry J. Sabato's Crystal Ball » WHAT’S THE MAGIC NUMBER? There is the magic number! If unemployment is higher than 7.2% as we head into the general election in 2012, we know President Obama is a goner. If it is lower, Obama gets an encore term. Can it really be this simple? First, note the necessary qualifier, “since FDR.” That is because Roosevelt was reelected to the White House in 1936 despite estimated unemployment at about 17%, but that was down several percentage points from Herbert Hoover’s Waterloo in 1932. Again in 1940, Roosevelt won a third term with unemployment at 15%. Maybe these data are too outdated to matter, but they certainly suggest it may be the trend of unemployment that makes the difference. Is the rate going up or down? Are people optimistic or pessimistic about their economic future? FDR gave people hope. Of course, President Obama famously ran on “hope and change” in 2008, and his problem in 2012 is that, so far on the economy, Americans have little hope and haven’t seen much change. If the nation remains as glum as it is today, and if the current 9.1% unemployment rate fails to drop significantly, Obama may well get the boot in ’12 as long as Republicans nominate a mainstream candidate. But our point is this: No way is 7.2% the magic number. Take a look at Chart 1, which shows the unemployment rate at the time of each presidential election since 1960. Generally, a relatively high unemployment rate is predictive of the incumbent party’s defeat. 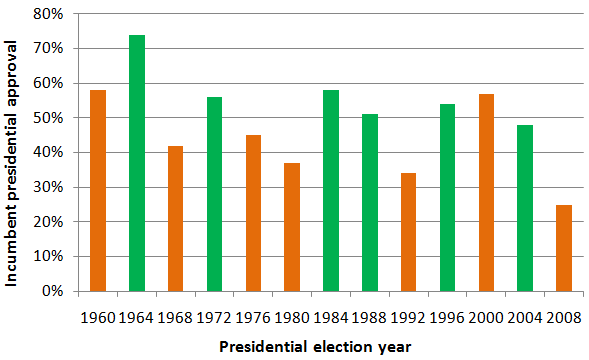 This happened in 1960, 1976, 1980, 1992 and 2008 (on the chart, green represents elections where the incumbent president’s party won the election; orange represents elections where the incumbent party lost). That isn’t the whole story, however. Unemployment was at 7.2% in 1984 when Ronald Reagan ran for reelection, and he won a landslide. Why? Because unemployment was falling noticeably from its recession high of 10.8% in December 1982. And look at the flip side of the employment coin. If unemployment were the alpha and the omega of presidential politics, then the Democrats would have won landslides in 1968 and 2000. Instead, Hubert Humphrey and Al Gore lost (the latter, one admits, on a technical knockout). HHH had as strong an employment picture as a candidate could hope to see; the nation was at almost full employment (3.4% unemployment). But the Vietnam War dominated the election, and produced the Nixon presidency. In 2000, ethics and personality arguably counted for as much as the Democrats’ low 3.9% unemployment rate, getting George W. Bush within striking range. It’s now clear that unemployment is an imperfect forecasting tool for presidential elections. What about overall economic growth, usually represented by the gain or loss in Gross Domestic Product (GDP)? Let’s go to Chart 2. 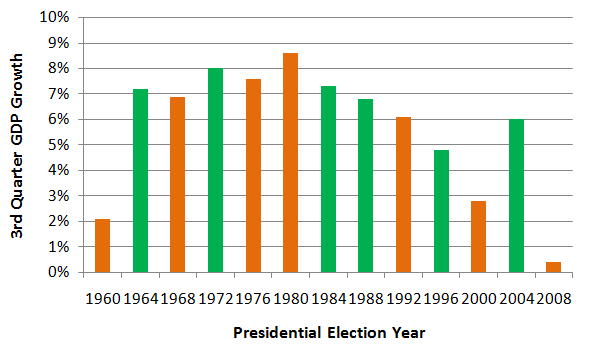 Note: Green represents elections where the incumbent president’s party won the election; orange represents elections where the incumbent party lost. We might have chosen to focus on GDP growth in the election year taken as a whole, but that average can hide the real trend during the most critical election months. So here, we’ll look just at the quarter closest to the actual election day: the third quarter, July 1 to September 30, which gets reported before people vote and almost always is used by one side or the other on the campaign trail to describe the shape of the economy. GDP growth in the third quarter is actually a better indicator than unemployment of forthcoming election results. The three worst years for growth jump off the chart: 1960 (2.1%), 2000 (2.8%), and 2008 (a miserable 0.4%). In this trio of years, the incumbent White House party lost the presidency. However, even the GDP measure is far from a slam-dunk predictor. Near 7% growth in 1968 couldn’t negate Vietnam as an election factor. Watergate and the Nixon pardon, as much as anything else, sunk Gerald Ford in 1976, despite a healthy 7.6% GDP gain in the third quarter. And look at Jimmy Carter in 1980: An 8.6% growth rate — the best on the chart — couldn’t save a president stuck in the malaise of high inflation, high interest rates and an insoluble Iranian hostage crisis. Similarly, a solid 6% growth rate was unable to rescue Bush Sr.; the economy had been too sluggish for too long, and Bush didn’t appear to “get it.” Bill Clinton actually had a lower economic growth rate in 1996 for his successful reelection (4.8%) than Bush had in his losing race (6.1%). The difference? Perceptions of the economy were better. Voters felt the modest growth surge and believed America had finally turned the corner. Whether voters are looking at unemployment or growth rates, they are asking themselves whether conditions are improving (meaning the incumbent party is reelected) or stagnating and worsening (incumbent party is defeated). Even that common sense model is oversimplified. If a big scandal or an unpopular war takes center stage, the economy can take a back seat. It is not always the economy, stupid. If you insist on looking at just one number for an incumbent president seeking reelection, it is probably best to choose presidential popularity — the answer to the question, “Do you approve or disapprove of the job President X is doing?” This is a marvelous summary statistic, because it forces voters to take all the issues of the day into account, projecting their own issue priorities onto the president. When reliable polls show the proportion approving of presidential job performance is 50% or above, the incumbent is highly likely to win. The further the number falls below 50%, the less likely the incumbent is to get his second term. Note: The most recent Gallup polling before the presidential election was used. 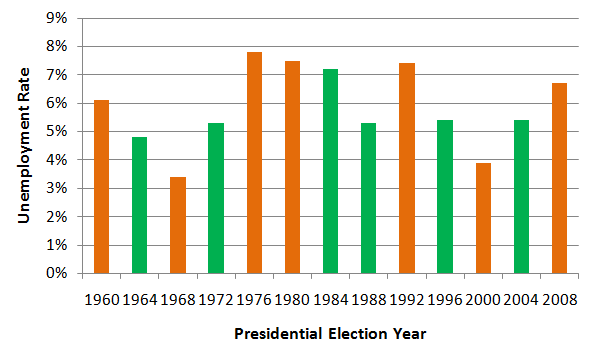 Green represents elections where the incumbent president’s party won the election; orange represents elections where the incumbent party lost. Notice that presidential approval cannot always be transferred to the non-incumbent candidate of the president’s party. Dwight Eisenhower had a very healthy job approval before the 1960 election (58%), but his candidate, Richard Nixon, lost. Bill Clinton was at 57% right before the 2000 election, but that wasn’t enough to get Al Gore into the White House. Ronald Reagan’s role in delivering his third term to the senior Bush in 1988 was extraordinary, not the norm. More often, the converse is true: unpopular incumbents insure the defeat of their party’s nominees: Harry Truman in 1952, LBJ in 1968 and George W. Bush in 2008. Finally, let’s remember that third-party candidates can add to the unpredictability of allegedly predictive numbers. While the available research doesn’t fully support the conclusion, it is at least possible that George H.W. Bush would have won a second term without the presence of Ross Perot on the November 1992 ballot. And Ralph Nader may have received just 2.7% of the vote in 2000, but it was enough to deprive Gore of both New Hampshire and Florida, either of which would have given the Democrat the presidency. For 2012, one could conjure up a multi-candidate field — say, including an independent Tea Party contender or a Green party nominee — that could produce an odd outcome. So data crunchers, continue your search for the magic number. We do it ourselves. These analyses are always fun and sometimes enlightening. But to a degree, this is a search for El Dorado, the mythical city of gold that tantalized — and ultimately frustrated — European explorers in the sixteenth century. Maybe it’s truly there, but nobody ever found it.